With near perfect weather settling in around Anna Maria Island, the fishing is sure to follow suit. As for the last week of February, we are experiencing temperatures in the mid 80s, resulting in the perfect scenario for some great springtime fishing. The tail end of sheepshead bite is going strong — but not for long. With the recent full moon, these fish are in mid spawn and once that spawn is over, they will disperse throughout our waters making them much harder to target. But, that’s okay. With water temps on the rise, fishing the flats is starting to really heat up. Schools of white bait are slowly making a showing on the flats, which means it’s time to start netting bait again. Or you can just buy them from M&M bait company in front of Kingfish boat ramp. Sooner than later it’s going to be necessary to have shiners in the bait tank if you plan on fishing the flats successfully. Even now, with the water temps in the high 60s to low 70s, shiners as bait are working well for catch-and-release snook and redfish. Spotted seatrout are also responding positively to shiners. 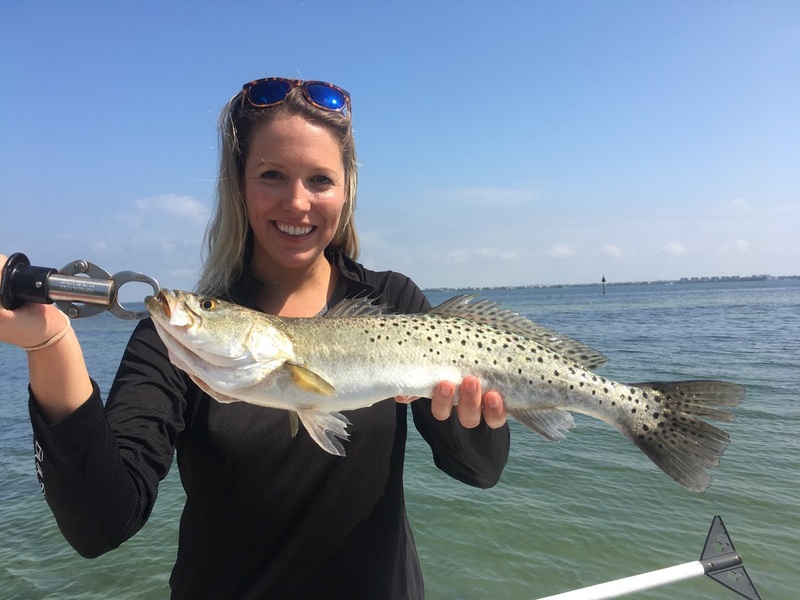 Speaking of spotted seatrout, don’t forget that the Florida Fish and Wildlife Conservation Commission has implemented a new rule as to size limit for spotted seatrout. You can no longer harvest any spotted seatrout over 20 inches in our region. The slot remains 15-20 inches and the bag limit remains at 4 fish per person per day. It’s probably best to be in the habit of letting these “over 20-inch fish” go anyway, as they are spawning fish. Plus, they’re usually riddled with worms. Other spring inshore action includes pompano and whiting. These fish can be caught along the beaches of Anna Maria by casting live shrimp or sand fleas into the surf. While targeting these fish, you may also encounter some black drum and maybe a bonnethead shark or too. On my Southernaire charters, I’m finishing up the sheepshead bite before they spawn out. We’ve had quite a few 5-6 pound sheepies as well as numerous fish in the 2-pound range. While targeting sheepshead, I’m noticing the welcome arrival of mangrove snapper. These guys are being caught more and more frequently and are averaging 12-14 inches with some coming in at 18 inches. Dock fishing for redfish is pretty good, although as the water temps rise, I’m noticing the reds are starting to disperse. I’m seeing a few black drum mixed in with the redfish bite, but again, they are beginning to move on. Fishing the flats for spotted seatrout is starting to be quite good. I’m catching many fish in the slot of 15-20 inches and actually quite a few over slot fish, too. These fish are being caught on live shrimp under a popping cork.